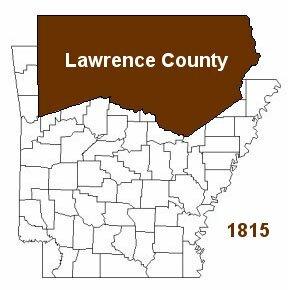 By the Legislative Act of Missouri Territory, January 15, 1815, Lawrence County was formed from New Madrid Co., Missouri. 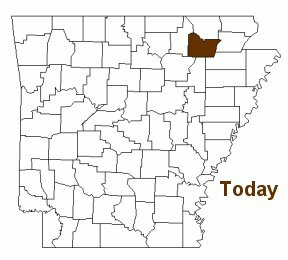 Arkansas County was the first county and Lawrence County was the second county formed in what is now called the state of Arkansas. From Lawrence County thirty-one other counties were formed. Thus called “Mother of Counties”. Lawrence county was named for Captain James Lawrence, a naval commander who was killed in the War of 1812. When Lawrence County was formed, Davidsonville, which was first named Lawrence, was the county seat. In 1829, the county seat was moved to Jackson. In 1837, Smithville became the county seat. Powhatan became the county seat in 1869. At the completion of the Iron Mountain Railroad, the county seat responsibilities was shared by Powhatan, for the western county seat, and Walnut Ridge for the eastern county seat. 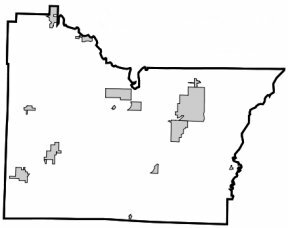 The dual county seats ceased in 1963, when a single county seat was put into effect, which is the present day Walnut Ridge. With Strawberry River, Black River, Spring River, Lake Charles and the many creeks, water sports are a favorite attraction for tourists. Lawrence county is surrounded by: Randolph county to the north; Greene county to the northeast; Craighead county to the southeast, Jackson county to the south; Independence county to the southeast; and Sharp county on the west.